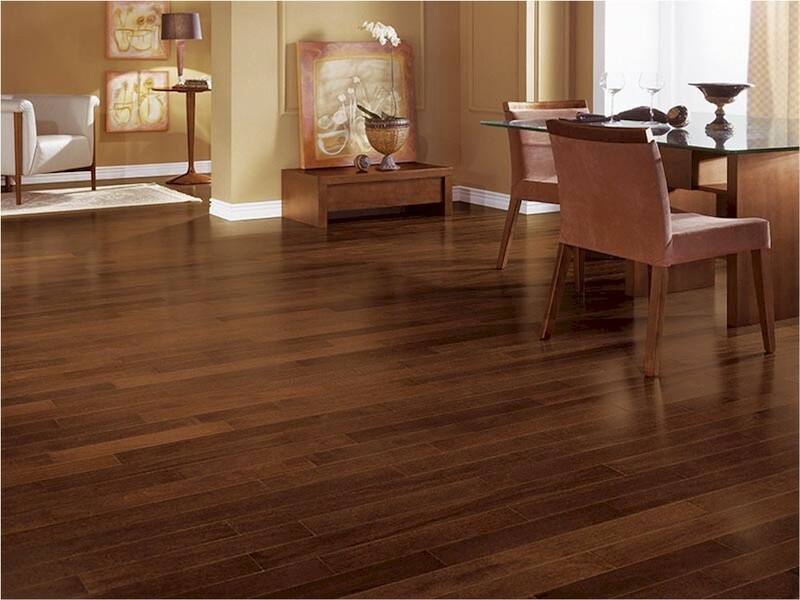 Hardwood flooring layout can be a huge factor when it comes to the outcome of a new floor installation. Many people do not think about the direction that they can lay the planks in to achieve unique and memorable looks. So today we will be discussing a few common and less common hardwood flooring layouts. Before getting to the main discussion let's talk about some possible challenges that need to be addressed if you choose a less traditional layout. In modern architecture, homes typically have a floor joist system in place as well as a subfloor. This can effect your options, as in this case the joist direction can weaken the performance of solid 3/4 inch hardwood flooring. It has always been known that installing perpendicular to the joists will provide stronger support for the floor. Installing with the floor joist system in a parallel fashion can lead to boards separating or sagging. So how do we fix this? This is easily remedied by installing another layer of plywood to the existing subfloor. We would suggest a 3/8" plywood if you are going to run the floor parallel to the floor joist system. If you are thinking about a perpendicular installation you should run the plywood perpendicular to the existing subfloor, overlapping the older seams of the subfloor sheeting. What if I have an Older Plank Subflooring? In this case your subfloor should have been installed diagonally. This is great for those of you wanting a diagonal installation. Concrete? When it comes to concrete you really have the most options without having to do anything extra to your concrete subfloor. This is because there are not really any structural subfloor component that can drastically reduce the performance of the hardwood flooring, with the exception of pre-stressed or precast concrete. In this case you will need to contact a professional to evaluate the challenge. Most experienced installer will have a better understanding of what direction the floor should run, and will more than likely suggest this route. But in the long run, any type of subfloor can be altered to give you the floor layout that you have been wanting, so do not let this discourage you. Where there is a will, there is also a way! Because there are so many blogs available on a traditional direction hardwood installation, I will not be discussing it today. Instead I will talk about 45° and 10° angles. The best area of the room to start this installation is in the corner of the room. By taking a solid piece of plank and cutting ends of the board at a 45° angle, will allow for it to fit the wall snug, giving you the perfect place to align your flooring. For the starting area there is no specific method on how far out of the from the corner it should be, buy you may want to dry lay pieces in the area if your not looking forward to cutting small triangles in the corner. Diagonal installations will have a tendency to bend at the perimeter. This happens because the floor doesn't have enough backing to keep it aligned with the firmer large areas of the room. Bending will be hard to notice at first and typically are noticeable after several rows have been lain down. To prevent bending from building up use wedges after every row or two, just insert the wedges against the wall or base and you will have a lot less to worry about. Make sure to keep an eye on your control line as well. When doing a 10° layout, be prepared for a headache. Patience is the main factor in achieving this stunning layout. You will need to keep the correct amount of expansion space around the perimeter of the installation area. Usually the biggest problem on will run into is keeping the same angled cut around the wall lines while so many separate pieces are being used. Also, keep in mind that a standard saw cannot cut past a 48 degree angle, so plan on using a jig. That being said, the easiest way to make this cut is to establish a template with a scrap piece of wood that is 2 ft long. After you have found the desired angle, create the template board to be used for the remainder of the installation. As far as the tools that you will be requiring, any table saw will be sufficient, however a bit unsafe. If you choose this course, make sure to use caution as severe angles cater to blade binding, and can result in the board being forced suddenly away from the saw. For the safer route, go with a jigsaw! I hope you enjoyed Today's Blog, Until next time, Happy Home and Flooring!